* Click HERE to hear the song “MIGRANTE” by Alpas, Filipino and Tagalog lyrics below. Filipinos across the US, under the banner of BAYAN USA, march with our fellow im/migrant and all other exploited workers in the US and around the world this International Workers Day 2013. The immigrant struggle is at the heart of the global and US class struggle, where capitalist exploitation is most acute, and from where greater mass movement and resistance signals hope. US immigration policy being crafted in Washington seeks to manage the import of foreign labor from poor countries in order to answer the labor needs of big business in the US in a time of crisis. This includes beefing up the US economy’s reliance on its military and prison industrial complexes. It is no wonder that Correctional Corporation of America (CCA) and Geo-Group (GG)– the two largest private prison companies in the US– are investing tens of millions of dollars to influence the Gang of 8 to enact an enforcement-heavy immigration bill. The bill includes heavy militarization of the US-Mexico border, increasing the operations of the Immigration and Customs Enforcement (ICE), as well as building and filling up more immigration prisons across the country. Another demand of big business in the US is surplus, undocumented labor living in fear. This makes it easier for employers to exploit their workers through wage-theft schemes. Labor trafficking also worsens under the current guest worker or work visa program. Employers connive with illegal recruiters who extract exorbitant fees from foreign workers migrating to the US falsely advertising they will have their work visas processed once they get here, only to have their visa applications shelved and passports confiscated by their employer, forcing them into undocumented status. An example of the modern-day slavery brought about by the exploitation, wage-theft, and trafficking combination scheme can be seen through the struggle of the Grand Isle Shipyard workers in New Orleans. Over 4,000 Filipino leave their country daily to work abroad. The Philippine government oversees this massive outmigration through it Labor Export Program (LEP). The Philippine economy relies on remittances from its overseas Filipino workers (OFWs) to service its chronic debt to the International Monetary Fund (IMF) and the World Bank (WB). While the Philippine government lauds OFWs as so-called heroes, they turn a blind eye to the systemic exploitation, discrimination, and abuse faced by OFWs all over the world, including the US. In 2012, OFW remittances hit a record USD $20 billion. OFWs currently toil in over 110 countries. The Philippine LEP practice of commodifying migrant workers into cash cows and neglecting their social conditions served as a model for the Global Forum on Migration and Development (GFMD) in 2007. The GFMD was created out of a UN High-Level Dialogue on Migration that sought to adopt a framework for managing global migration to serve the needs of neoliberalism. Since its founding assembly, migrant workers across the world have gathered to protest every GFMD meeting, and expose it as a tool for the super-exploitation of migrant workers. The mass movement of migrant workers against the GFMD every year has forced UN member states to re-assess it in another UN High-Level Dialogue this October in New York City. Immigrant workers are gearing up to gather in protest once again to further frustrate their neoliberal agenda. The immigrant struggle is key in advancing the anti-imperialist struggle in the US, as the US is the world’s biggest labor-hosting state with an increasing demand for foreign workers. BAYAN USA remains committed to advancing the anti-imperialist struggle in the US by linking the immigrant struggle to the overall class struggle within the US, as well as the struggle against US economic, political, and military intervention abroad. Regarding the current immigration reform discourse, we endorse the platform of the National Alliance for Filipino Concerns (NAFCON). There are approximately 4.5 million Filipinos in the US, 1 million of which are undocumented. The dire economic conditions that force the mass exodus of Filipino workers from their country are tied to over 114 years of US intervention– including 114 years of US military occupation. The Philippines was the first and only direct US colony in Asia and to this day the Filipino people suffer from that colonial-turned-semi-colonial relationship. It is this type of unequal relationship to global monopoly capitalist powers that prevents many labor-sending countries, where the majority of the world’s immigrants come from, to develop the economic capacity to provide for their domestic populations. All over the world, workers are commemorating International Workers Day by struggling against the neoliberal economic offensive of monopoly capitalism. Immigrants in the US, as economic refugees of imperialism, continue to fight for human rights and dignity under US immigration policy and the pro-deportation stand of the Obama administration. Let us unite to strengthen and advance the immigrant and workers rights struggles in the US to resist and frustrate all exploitative provisions to immigration policy and towards a brighter future for all workers! Long Live the Spirit of May Day! Scrap the Philippine LEP and GFMD! No to the Neoliberal Economic Offensive! Justice and Dignity for All Immigrants and Workers! BAYAN USA Pacific Northwest at Rally Against Israeli Siege of Gaza. Seattle. Credit: Sincere Born. 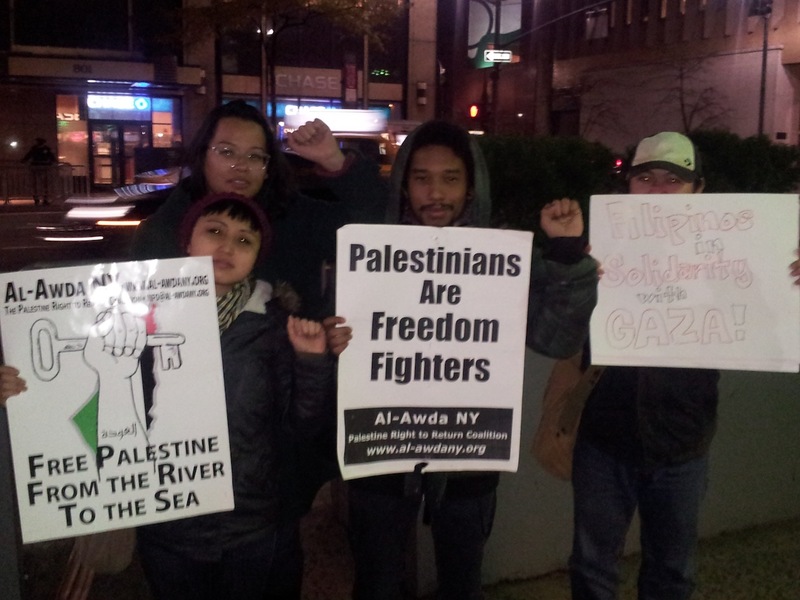 Filipinos from all over the United States, representing 18 different grassroots community organizations that comprise the progressive alliance BAYAN USA, have been taking part in actions protesting and condemning the recent all-out assault on the people of Gaza by the U.S.-backed Zionist state of Israel. According to the Palestinian Center for Human Rights, since Wednesday the U.S.-funded and -armed Israeli Defense Force (IDF) has injured and maimed over 250 innocent civilians, including at least 62 children, killing at least 19, including 10 civilians. This ongoing massacre against the people of Gaza has been carried out with the tacit support and approval of President Barack Obama and has even been applauded by the U.S. Senate. The IDF began its bombing of Gaza with the illegal assassination of Hamas military chief Ahmad al-Jabar on November 14th which was an act in violation of International Humanitarian Law and also the breaking of a truce that Israel had signed with various leading Palestinian organizations. BAYAN USA joins the Palestinian people in calling on Israel to stop its senseless attacks on the people of Gaza and to end the U.S. backed occupations of both Gaza and the West Bank. BAYAN USA recognizes that the key problem of the Palestinian people is the U.S. imperialist-backed Zionist Israeli state which has prevented Palestinians from being able to return to their land for over 60 years. In order for there to be genuine peace the U.S. must keep out of the affairs of the Palestinian people and the Israeli state must give up its murderous Zionist path and let the Palestinian people return to their homeland. 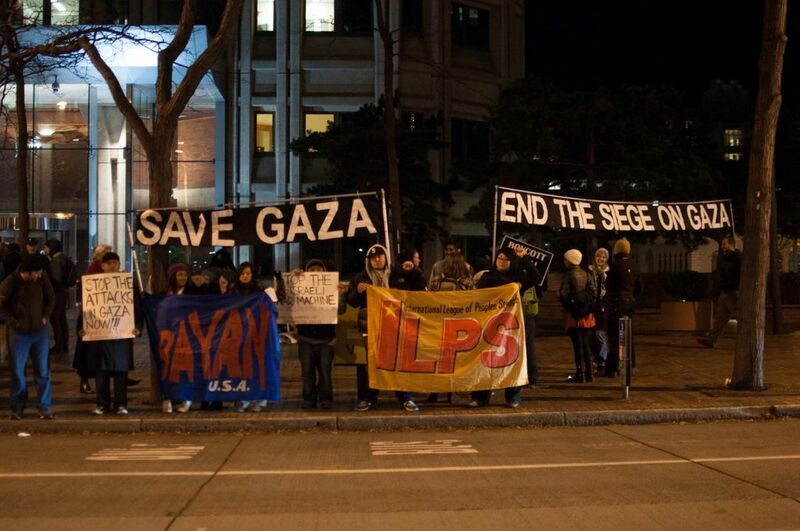 BAYAN USA Northern California at Rally to End Israeli Siege of Gaza. San Francisco. Credit: Lenina Bustamante. 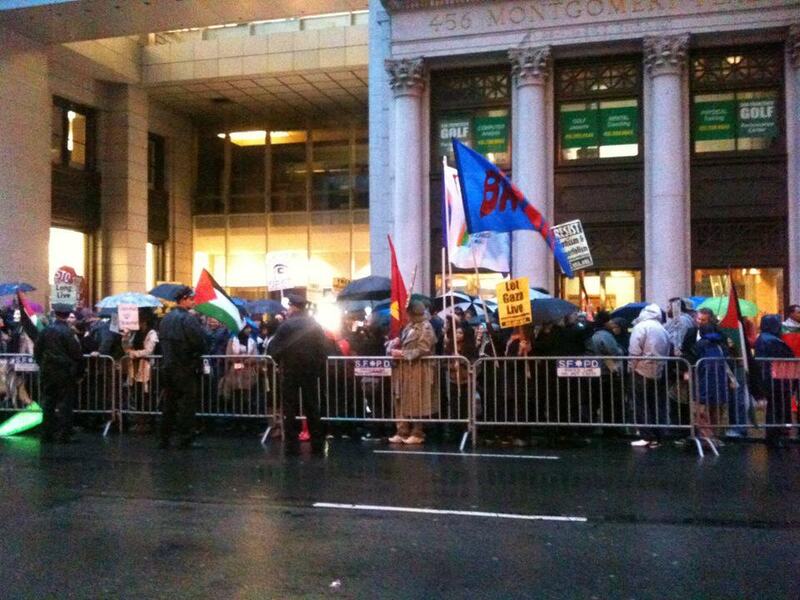 BAYAN USA Northeast at Rally to End Israeli Siege of Gaza, New York City. Credit: Hanalei Ramos.